Madonna, who has made a career flouting conventions, customs, and Catholicism cannot be too happy to see her iconic song, “Like a Virgin,” converted into a prayer by the celebrity nun from Italy, Suor Cristina Scuccia. 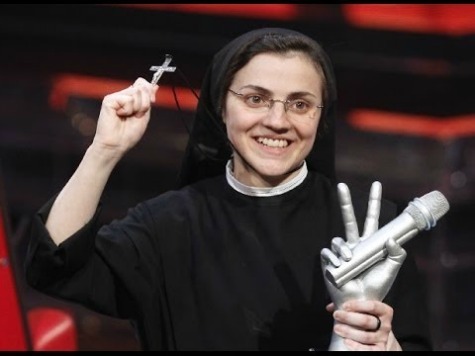 The 26-year-old Suor Cristina shocked the world last June by winning The Voice, the Italian equivalent of American Idol. Now, she has released the first single from her new album “Sister Cristina,” and it is a doozie. The religious sister has created a professional music video covering Madonna’s hit “Like a Virgin” as a spiritual canticle, set against the evocative religious architecture and canals of Venice, Italy. Singing to Jesus, Sister Cristina–literally, a consecrated virgin–has baptized one of Madonna’s most “irreverent” songs, taking her words of virginity literally and applying them to life in the convent. The album, Sister Cristina, is set for release in November.